Dunlop will soon be launching a Billy Gibbons Signature Series string set as part of the new 'Rev. 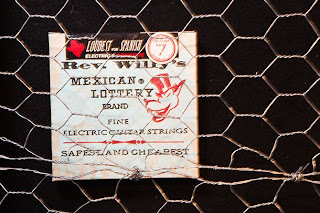 Willy's Mexican Lottery Brand' line. Or is that 'lineup', pardner? As is his preference, Billy's custom gauge set will include a very skinny .007" gauge first string. I'm guessing Billy needs his strings to really give under the attack of that Mexican peso he customarily uses for a pick. Other than Billy's own ultra-light custom gauge set, Rev. Willy's Mexican Lottery sets will also be available in regular gauges. ¿de dónde parque i mi mula? Mighty fine lookin' product! Wonder who is the OEM? Dunlop IS the OEM. They make their own strings, as well as strings for lots of other companies.